FK Lowry Piling have successfully completed a £270,000 Piling Project for McAleer & Rushe in Scotland. The £19 Million, 146-bedroom Hotel project is located on the famous Royal Mile in central Edinburgh. The six-storey hotel, which will have frontages onto both the Royal Mile and the Canongate, will be built behind an existing facade facing onto the Royal Mile. To the rear, the hotel will link with a proposed new public square and pedestrian walkway which will be central to the wider £150 million redevelopment. Work on the hotel began in the Summer and it is set to be completed by October 2016. FK Lowry Piling were sub-contracted to design and install Bearing Piles and a Contiguous Bored Pile Retaining Wall consisting of 154 No. 600mm Diameter CFA & 136 No. 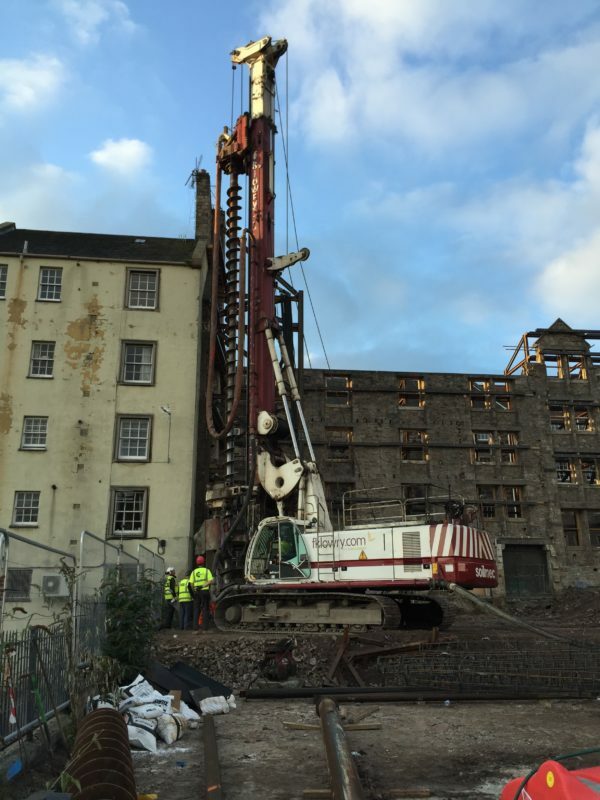 Rotary Bored Piles using their range of 70t high torque Soilmec Piling Rigs. The ground conditions consisted of up to 5m of Made Ground/Fill. This was underlain with Weathered Siltstone and Mudstone Bedrock at depth.